Needing a new opponent for his next title defense (and still unwilling to play Capablanca again), and with Bogolubov no longer a credible challenger in anyone's eyes, Alexander Alekhine picked a man who had lost two matches to Bogolubov, Max Euwe of The Netherlands. If Alekhine picked Euwe as another safe opponent, his plans went awry, owing to a combination of Alekhine's overconfidence, and the fact that by 1935, Max Euwe was a good deal stronger a player than anyone realized. The conditions for the contest was the best of 30 games, and 6 wins. 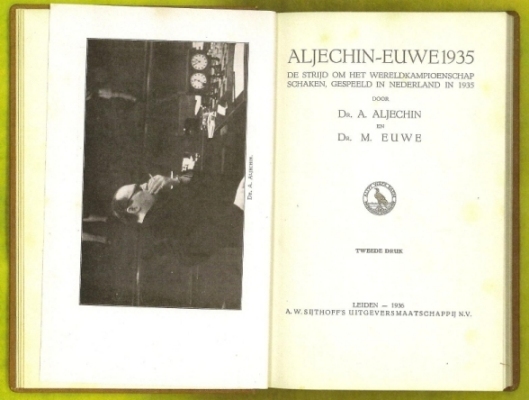 After 30 well fought games from October 3 to December 16, 1935, Euwe won the match to become the 5th World Chess Champion. 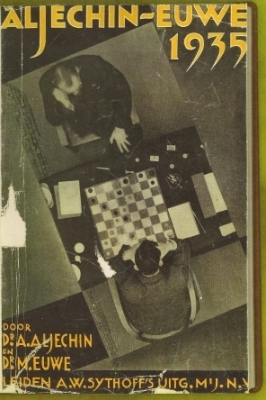 "Just before our match we played in a strong tournament in Zurich, which Alekhine won, but I beat him. I finished second, with 12 out of 15, after losing to Lasker in the first round. 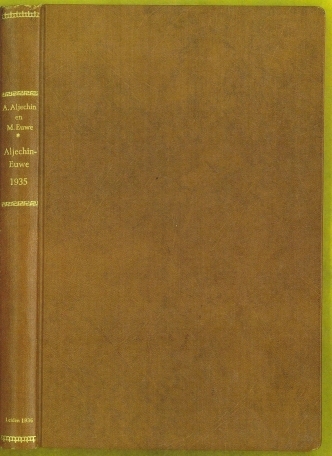 In analyzing the games, we came to the conclusion that Alekhine's superiority over other masters was his opening knowledge. If he could not get the initiative or some advantage in the opening, he was willing to enter complications to try to muddy the water. So I went to Vienna for a few months to study Becker's files on the openings, which were the most complete and up to date at that time. Besides Kmoch, who was an expert in the openings, I also had Maroczy's help, mostly in the endgame. The match was a close fight. Even after the 24th game the standing was 12-12 (the match was for thirty games). But then I won two games in succession, while Alekhine could only win one more. Of course it was stupid for me to give him a draw in the last game, since I had a won game. But the draw was enough for me to win the World Title." After 30 games, Euwe achieved victory of 15Â½-14Â½ and became the 5th World Chess Champion.